Saucon Valley students will enjoy another snow day Tuesday, as a winter storm is expected to blanket the region with a mixture of precipitation that will likely include snow, sleet and freezing rain. Superintendent Dr. Craig Butler announced Monday evening that schools will be closed and all after-school activities canceled. A Saucon Valley School Board meeting is still scheduled for 7 p.m. Tuesday at the high school, however. Meetings can be viewed live online via the district’s website. The National Weather Service has issued a winter storm warning for Northampton County–including Saucon Valley–where it says 4 to 6 inches of snow could accumulate along with one to two tenths of an inch of ice between Monday evening and Tuesday at midnight. A winter storm warning is also in effect for Lehigh County, Upper Bucks County and Western Montgomery County, where 5 to 7 inches of snow could fall and one to two tenths of an inch of ice could accumulate before midnight Tuesday, according to the National Weather Service. 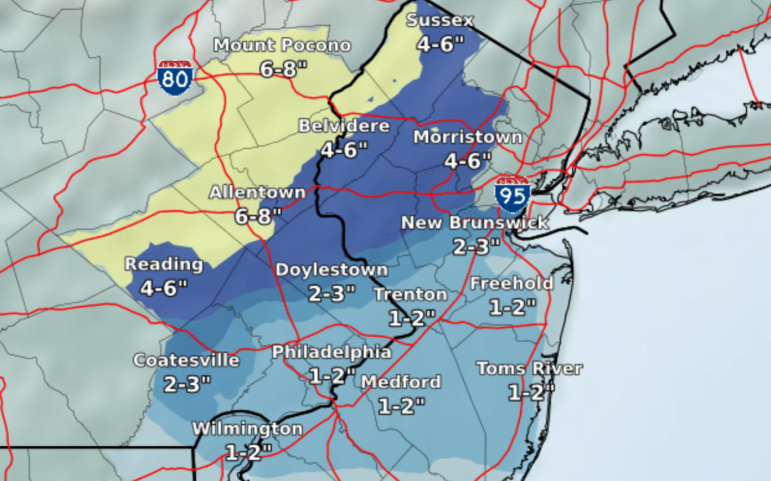 The National Weather Service office at Mount Holly, N.J., issued this snowfall forecast map for eastern Pennsylvania and New Jersey as part of its Monday evening winter storm briefing. As of 8:30 p.m., snow was slowly edging its way eastward south of I-80 in Pennsylvania, as depicted in the live radar image below from PA Weather Action. According to the PA Weather Action final call forecast from Sunday, the Lehigh Valley can expect to receive total snow accumulations of 3 to 6 inches, followed by sleet, freezing rain and rain. The company offers a free weather app that is available for download in the Google Play (Android) and App (Apple) stores. Lehigh Valley Weather Authority is predicting 2 to 5 inches of snow for the Lehigh Valley, but more in the way ice. According to a forecast map posted on the LVWA Facebook page Monday evening, two tenths of an inch to .35 inches of ice could accumulate.